You may think that since summer is over and the weather has turned cooler, we no longer have to worry about ticks. However, many species of ticks still are thriving in fall. So, whether you enjoy camping or just playing in the yard, you’re likely to encounter ticks. These blood sucking arachnids are known to transmit several diseases and should not be ignored. The four most common ticks found in Georgia are the Lone Star tick, the American dog tick, the Brown dog tick, and the black-legged tick. They all share a similar life cycle consisting of eggs hatching into larva, then becoming a nymph, and then adult. The tick needs a blood meal at each stage to grow into an adult and lay eggs to start the cycle again. The Lone Star tick (Amblyomma americanum) uses a variety of hosts including livestock, dogs, deer, humans, birds, and rodents. The female has a single white spot in the middle of the back, while males have scattered spots or streaks around the margin of the body. The American dog tick (Dermacentor variabilis) prefers dogs as it’s host, but it will also feed on large animals, including humans. Both males and females are brown to reddish brown with light colored markings on their backs. 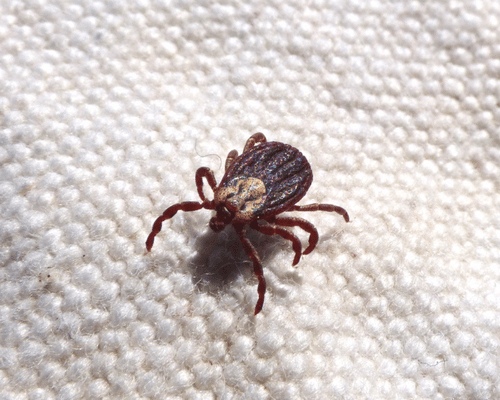 This tick is the most common vector for Rocky Mountain Spotted Fever. The Brown dog tick (Rhipicephalus sanguineus) mostly feeds on dogs. It is reddish brown but smaller than the American dog tick. This tick is set apart from other species because it can complete it’s life cycle indoors. The black-legged tick (Ixodes scapularis), also known as the deer tick, is small and does not have any white markings. It is common on white-tailed deer, dogs, birds, humans and other large mammals, as well as some small rodents. This tick is the most common carrier for Lyme disease. Ticks are great at finding a host by detecting exhaled carbon dioxide and body warmth. They thrive best in high grass or brushy areas. Ticks will climb to the tip of a blade of grass or leaf and wait patiently for a suitable host to brush up against it. 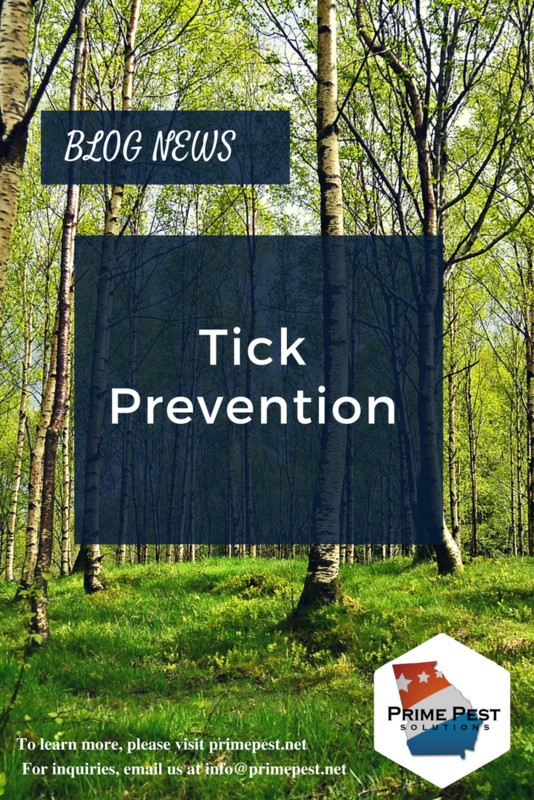 The best way to avoid a tick bite is to stay away from areas they are likely to be. Keep grass cut short. If you are on a wooded trail or high grassy area, there are some precautions that you can take. Wear long pants, and tuck the pant leg into your socks. Tuck your shirt inside your pants. Ticks will crawl around to find a suitable spot, so the less bare skin, the better chance of brushing it off before attachment occurs. Use a repellent containing “DEET”, and check yourself thoroughly for ticks. Early removal is good disease prevention. If you do find yourself with a tick, do NOT twist or jerk to get it off. This could cause the mouthparts to break off, resulting in an infection. Use tweezers around the tick as close to the point of attachment as possible, and remove with a firm pull. Apply a disinfectant to the site after removal. Make sure to check your pets regularly as well for any ticks, especially behind the ears and between the toes. With a little caution and prevention, ticks don’t have to keep you indoors. So, enjoy a nature walk, but make sure nature doesn’t hitch a ride home on you!